Resource curse – chance for turning the horn of abundance! Now is not the best time for the Russian economy. According to experts, Russia ‘owes’ the economic growth slowdown to its abundance of natural resources. Non-government environmental organizations believe that natural riches should encourage the country to develop, and gradual abandonment of subsidies to fossil fuel and support of renewable sources will become a serious incentive for the economy’s development, have a positive climatic effect, and improve the political image. In 2014, Russia’s economic growth rate of just 0.4% is hardly encouraging. Plans have been announced to raise taxes and withdraw pension savings. Meanwhile, oil and gas, which have been the economy’s foundation for a long time, are losing ground and transforming from a locomotive into a cost item. Even tax benefits and preferences can no longer help. According to international experts, a crying need to establish a basis for a post-oil future had existed ‘already yesterday’. It means, as they explain, that Russia should change its priorities immediately, i.e. burn much less oil and not increase its production. By subsidizing the traditional sources, Russia is putting both its climate and economy at double risk, non-government environmental organizations agree. 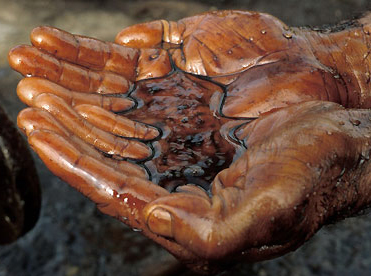 Economists described the ‘mechanics’ of the resource curse as early as in the 1970s. In their opinion, the drop in competitiveness of all the products except resources causes ‘Dutch disease’, a negative effect of unstable raw material prices on the economy, and imperfection in the operation of the financial market. However, there are also positive examples proving that the resource curse can in fact be overcome. The most outstanding example is Norway. Realizing that ‘the oil fairytale’ would end some day, the Norwegian government made a decision to accumulate the oil money for the needs of future generations. A financial scheme was established of a state oil fund, which prevented the economy from ‘overheating’, inflation from growing, and the national currency from becoming too strong. Russia today is facing a serious choice of sticking to the inertial ways or opening a new way that it is not accustomed to. The experts see good perspectives for Russia in low-carbon scenarios of development. In a review of the results of a report by the Sustainable Development Solutions Network and Institute for Sustainable Development and International Relations research centers that examined opportunities for reducing the carbon intensity of the economies by 2050, Kommersant has quoted an expert saying that there is a real opportunity to decarbonize the national economy by 2050 with continued growth of the economy and income per capita (according to the forecast, up to USD 40,800 in the prices of 2012).